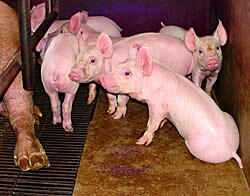 A farm worker needed hospital treatment after being attacked by a herd of pigs, Norfolk police said on Sunday. The 51-year-old man was knocked over by a sow at a Norfolk farm, prompting the rest of the herd to attack him. "It seems that when he fell, he was attacked by one of the sows and then the other pigs joined in," a Norfolk police spokesman told Reuters. "He suffered bumps and bruises and a head injury though it is not considered to be life-threatening." The police spokesman said it was the first time he had heard of a pig attack in the area -- but it was unlikely the herd would be put down. CHICAGO - A man has been charged with trying to extort $1.5 million from Oprah Winfrey by threatening to release recorded telephone conversations he claimed would hurt her reputation, according to the FBI and published reports. Keifer Bonvillain, 36, targeted a person identified only as "a public figure and the owner of a Chicago-based company," according to a criminal complaint filed in U.S. District Court. The Chicago Tribune and the Chicago Sun-Times, citing unnamed sources, reported Saturday that Bonvillain's target was Winfrey. Bonvillain, of Atlanta, was arrested Dec. 15 in the parking lot of an Atlanta hotel and released on $20,000 bail. He was scheduled for a preliminary hearing in Chicago on Monday. According to the complaint, Bonvillain met a California-based employee of the Chicago company at a party more than two years ago, then recorded conversations with the employee about the owner and her business. In mid-October he sent the owner an e-mail, telling her an employee said awful things about her, the complaint states. A month later, Bonvillain sent a letter saying he had tapes of the conversations, an FBI agent alleges in the complaint. In response, another associate of the company called Bonvillain and learned he had taped 12 hours of those discussions. Over the next few weeks, Bonvillain told the associate he wanted to publish a book based on the tapes and claimed he had received offers of $500,000 to $3 million from tabloids and book publishers, the complaint said. "There are a lot of people who would want these," Bonvillain said, according to the complaint. The associate, who was working with the FBI, agreed to a $1.5 million price, wired Bonvillain $3,000 in earnest money and arranged to meet him in the parking lot, the complaint said. Bonvillain was arrested the next day. Bonvillain told the Sun-Times the charges were a misunderstanding. "There is nothing to it," he said. "It's nothing. It was a big mix-up." A call Saturday to a number for a Bonvillain in Atlanta reached a recorded message saying the line had been disconnected. Bonvillain's attorney, Kent Carlson, told the Tribune and Sun-Times he could neither confirm nor deny details in the complaint. Phone and e-mail messages left by The Associated Press for Carlson were not immediately returned Saturday. 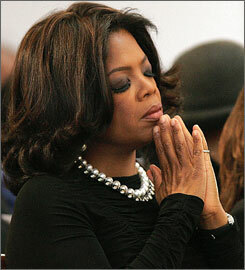 Winfrey was out of the country Saturday. There was no immediate response to phone messages seeking comment from Harpo Productions Inc., Winfrey's company, or the U.S. attorney's office. Oprah Winfrey: "I Don't Believe In Failure"
Bra Stops Bullet, Saves Woman's Life. ST. PETERSBURG, Fla. -- A woman watching New Year's Eve fireworks from a picnic table found out that her bra can do more than lift and support: It also slowed a falling bullet. The .45-caliber bullet struck Debbie Bingham, 46, after someone fired a gun into the air about 20 minutes before midnight. She still needed stitches, but the wound might have been much worse except for the bra strap, police spokesman George Kajtsa said. Bingham, who was in town from Atlanta, said she is thankful for the undergarment, which she said was "very cheap." "I'd love to have a couple more of those bras," she said. Bingham said she was listening to music and enjoying the fireworks with her daughter and son when she felt a sharp pain in her shoulder. Then Solanda Bingham, 30, noticed blood seeping through her mother's white shirt, and they found the bullet lodged halfway into the gold-colored bra. The other half was barely breaking the skin, Bingham told WTSP-TV. Kajtsa described the wound as a "big scratch with bruising." St. Petersburg police were searching for the shooter to determine if the shooting was intentional, Kajtsa said.